I was confused. “What are you guys doing?” I asked. After further inquisition, I learned that it wasn’t just any three numbers but positive integers only, that none can be larger than 15, and that they must be distinct. A woman asks her neighbor the ages of his three children. “That’s not enough information,” the woman replies. “The sum of their ages is your house number,” he explains further. “I still don’t know,” she says. “I’m sorry,” says the man. “I can’t stay and talk any longer. My eldest child is sick in bed.” He turns to leave. “Now I know how old they are,” she says. What are the ages of his children? You should be able to solve that one on your own. But if you’re not so inclined, you can resort to Wikipedia. I particularly like the latter one. If you think about it the right way (divisibility rules, anyone? ), you’ll solve it in milliseconds. Three distinct positive integers, each less than or equal to 15, are selected at random. What is the most likely product? So, yeah. These are the things that happen in our geeky household. Sure, we bake cookies, play board games, and watch cartoons, but we also listen to the NPR Sunday Puzzle and create math games. You got a problem with that? Yes, I know you probably think I’m jumping the gun by 50 days, and you probably think I spelled pie wrong, too. But you’re wrong on both counts. The American Pie Council (who knew there was a pie council?) 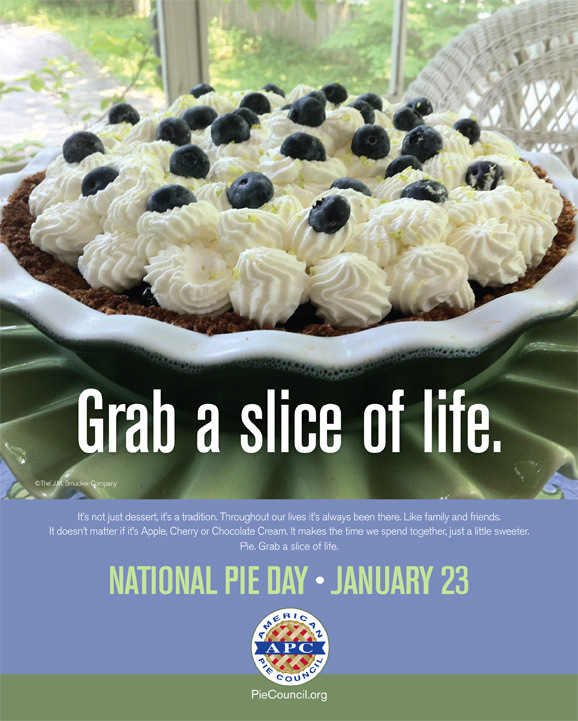 has declared that January 23 is National Pie Day. And grab a slice of life! And here’s a crazy fact about pies: In 1644, Oliver Cromwell banned pies as a pagan form of pleasure, and the ban lasted for 16 years. Which means that Oliver Cromwell nudges out the Anti-Saloon League as the winner of the stupidest prohibition in history. But you didn’t come here for pie facts, you came here for pie jokes, right? So let’s get on with it. Because it needed a filling. Who led mathematicians out of Hamelin? An infinity of mathematicians walked into a bakery. The first one ordered a slice. The second one ordered half a slice. The third one ordered a quarter slice. And so on. The baker said, “You’re all idiots,” and gave them two slices. “I’d have four pies,” he answered. I fell asleep on the couch last night while watching Modern Family. At 3:14 a.m., I woke up, left the couch, and stumbled to bed. Several hours later, my son Eli came into our room and woke me. That was at 6:28 a.m. My wife agreed to take the morning shift, so I fell back asleep. When I woke again, it was 9:42 a.m.
Then, at 12:56 p.m., I received an email from my friend Pat Flynn, and I was cheered by the silliness of the subject line: “My new favorite quadratic formula song.” I smiled thinking about the possibility that anyone would have a favorites list containing more than one song about the quadratic formula. This was a rather uneventful sequence… except that the times were π, 2π, 3π, and 4π. Sort of. To two decimal places, 4π = 12.57, not 12.56. 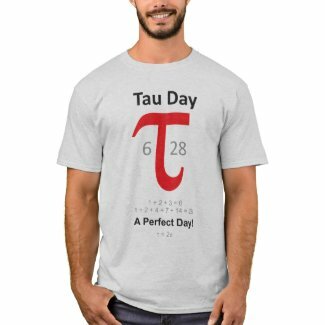 So my theory that my life is ruled by π was discredited. And here are a few quotes about π you might enjoy. I recently read a conference proposal in which the potential presenter declared, “PEMDAS must die!” Upon reading this, I thought, “Hear, hear!” But then the potential presenter claimed, “We should use GEMDAS instead!” Really? Does this presenter honestly believe that changing P (parentheses) to G (grouping) is sufficient to eliminate all the problems students have with order of operations? I have heard that some teachers use GEMS, where M stands for both multiplication and division and S stands for both subtraction and addition. That eliminates the problem some students have, thinking that multiplication has to happen before division or that addition has to happen before subtraction. Whatever. From my experience, most of the trouble students have with PEMDAS, GEMDAS, or GEMS typically results from a failure to consider it at all when working with a complex expression. It isn’t the mnemonic. Here’s a mnemonic for remembering what a mnemonic is: Think about a person with a terrible memory who previously suffered an inflammatory lung condition. Imagine that he often makes up catchy little phrases to help him remember things. Then you can make the association of pneumonic with mnemonic, and you won’t have any more trouble. There, now… isn’t that simple? The following are some of my favorite mnemonics. Cosine Cosine, Sign Sine Sine! In 1995, Mike Keith wrote a poem called Poe, E., Near A Raven, which gave the first 740 digits of π (the number of letters in each word indicates the value for that digit of π). It was based on Edgar Allan Poe’s poem The Raven. But some people are never satisfied, so he later wrote the Cadaeic Cadenza, which gives the first 3,835 digits of π. What do you get when cross a mosquito with a fishmonger? Nothing. You can’t cross a vector (disease) with a scalar (fish scaler). What do you get when you cross a mathematician with a movie star? Dream on. It’ll never happen. While his humor may pique students’ curiosity, it certainly doesn’t hurt that Colin loves mathematics, too. In fact, it’s the primary reason he chose to become a professor. “The first time I proved something that no one else had ever proved, it was a rush. I really enjoyed that,” he said. “I still do.” He also loves that mathematics is free of personality issues when it comes to a proof. “You are either right or wrong,” he said. 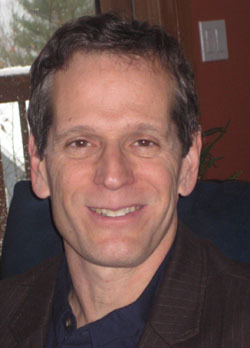 In 1998, Colin was honored with the Haimo Distinguished Teaching Award, the highest teaching award given by the Math Association of America. Impressively, four of the 61 recipients of this award have been from Williams College. If you want to follow in Adams’s footsteps, an online masters degree in education can help you improve your math teaching skills. I recently interviewed Colin to find out why he loves teaching and, hopefully, to learn a little about how to be mathematically funny. I love to come up with different ways to teach. The trick is to get people’s attention long enough for them to see the beauty of the mathematics in front of them. So I get a huge kick out of trying to come up with unusual ways to do that. Stories, jokes, plays, characters. What’s the funniest thing you’ve ever said during a lecture? I honestly don’t know. The ones that are unplanned are the funniest, and then afterward I forget what it was that I said. I just remember there was a big laugh. With you, Ed Burger, and Tom Garrity on the faculty, Williams College arguably has the funniest math department in America. Who would your students say is the funniest? We all have very different styles. They would say Tom is the wackiest. Ed is the one who would be the most likely to succeed in the real comedy world. He is a natural stand-up comic. I am the one who plays a part, and I’m funniest when I’m not myself but am playing someone else. So, depending on the student’s taste, they might give a different answer. Who is the funniest mathematician or professor you know? What’s the funniest thing that he or she ever said? I would say Ed Burger. He is always on. I remember when he was giving a talk to parents during Parent’s Weekend at Williams. He was demonstrating how you can tie your feet together, then turn your pants inside out and put them back on while keeping your feet tied together the whole time, a topological demonstration. When he dropped his trousers with his feet tied together, he had on boxers with purple cows (the Williams mascot) all over them. He waited a second, and then said, “All junior faculty at Williams are required to wear these.” I couldn’t stop laughing. Tell us about yourself. In particular, what things would you like my audience (a bunch of silly folks who like math jokes) to know about you? Let’s see. Before I wanted to be a mathematician, I wanted to be a writer. But then I fell in love with mathematics. It has been a joy to be able to go back to my previous interest and write math humor. Your list of math humor titles is impressive: the Streetwise Guides to Calculus, Riot at the Calc Exam, all of your “Mathematically Bent” columns. Which is your favorite, and why? If folks are only able to read one item that you’re written, which one would you want them to read? In addition to your writing, you also starred in a film, The Great Pi/e Debate with Tom Garrity, and you have several plays to your credit. Where is it hardest to be funny — on screen, in print, or on stage? For me, screen and stage are the same, in that all of my videos are based on stage productions. But the same production on video is never quite as funny as it was live. I spend a lot of time writing my material before I perform it. I am not an extemporaneous performer. When I do come up with something on the fly and it’s funny, and it goes over well, that is the best feeling. When not writing math books, which books do you like to read? Any favorite authors? I like to read lots of different books. Some science writers (John McPhee), some novels (Dave Eggers), some stories (Stephen King), some nonfiction (Christopher Hitchens).